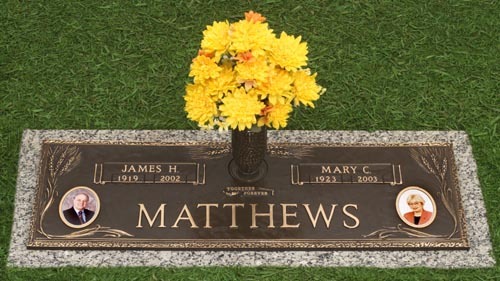 Create a personal legacy when you add a Matthews' Cameo Portrait to your memorial tribute. Our state-of-the-art process ensures that the Cameos retain their beauty indefinitely. They are ideal for placement on crypt fronts. Families can select steel-backed Cameos for and inclusion on flush bronze memorials. These wafer-thin Cameos can be mounted in integrally cast frames that can be applied to any bronze memorial design. The cameo and frame are no higher than cast bronze emblems. Matthews also offers miniature Cameos for placement on urns, crypt and niche plates as well as on niche fronts. Matthews' Cameos can be made from personal snapshots or professional portraits in either color or black and white. They are available in horizontal or vertical formats. 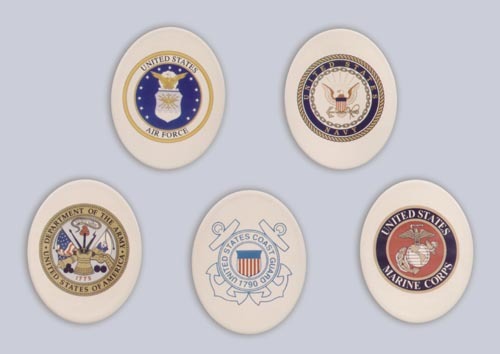 Matthews also offers steel-backed Cameos depicting the U.S. military emblems for placement on flush bronze memorials and crypt/niche fronts. On crypt or niche fronts, they can be used with Matthews' decorative bronze frames.